Phone giant Nokia has launched a free map and navigation service for its handsets that analysts believe could challenge stand-alone sat-nav devices. The service stores maps on the phone, cutting down the need to update and download new ones over the network. 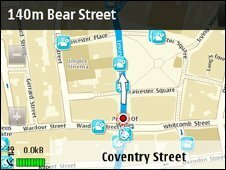 Ovi maps will initially be available on 10 handsets and will offer so-called "turn-by-turn" navigation, similar to that in existing GPS devices. It can display local data from travel guides, such as Lonely Planet. Users can also post their location to Facebook. Nokia said that it expects third-party developers to build new applications for the service. "It's like a giant mash-up environment," said Anssi Vanjoki, executive vice president of Nokia at the launch. The firm estimates that it has already sold 83m phones that can use the service, which can be downloaded for free from its Ovi application store. Mr Vanjoki said that it would be preloaded on all compatible phones offered by Nokia from 21 January. Previously, Nokia owners had to pay for its premium navigation service. Analysts at CCS Insight said the move could be viewed as a "competitive response to Google", which also offers a free live sat-nav for its Nexus One handset and the Motorola Droid. It also said that it was a "serious blow" for companies such as TomTom, which sell sat-nav devices. Most navigation services on mobile phones, including Google Maps Navigation, can download a limited number of maps to the phone but require a connection over the network to then updatethem on the move. This can be data intensive and potentially expensive when a user is in a foreign country. Nokia's answer is to preload many of the maps on to the phone. For example, Mr Vanjoki said that UK users who bought a new phone would get 2D and 3D European maps "out of the box". 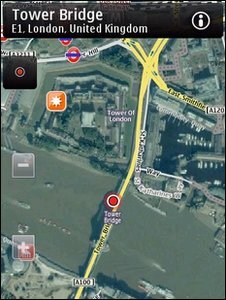 Other free maps can be downloaded to the phone over the mobile network, wi-fi connection or via a PC or Mac. To speed up the process of downloading maps over mobile connections, Nokia has turned to so-called "vector graphics", instead of traditional bitmap images. Mr Vanjoki said that as a result, images were "one tenth of the size" but looked very similar. The service will cover 180 countries, and offer turn-by-turn services, including voice navigation, for 74 of those. It features different routes depending on whether a user is on foot or in a car and will be available on 10 handsets at launch including the popular N97 mini. CCS Insight said that the service could reflect "Nokia's concern about falling share" in the smartphone market to rivals such as the iPhone and Blackberry. Mr Vanjoki admitted that the firm had been motivated in part to "drive handset sales" but said it also sees other opportunities to profit from the service in the future, including selling advertising around maps and applications.